I've always been a fan of gyros. Any kind of gyros. Greek gyros, North African style gyros, Middle Eastern style gyros. If it's a gyro, I will eat it, and I will eat it with great excitement. The first year that I lived in New York I would eat gyros eat least 4–5 meals per week from my favorite street card in Herald Square (we mostly have the Middle-Eastern inspired kind here). So when I saw a photo of these hit the Frequent Flyer last summer I almost lost my mind with excitement. 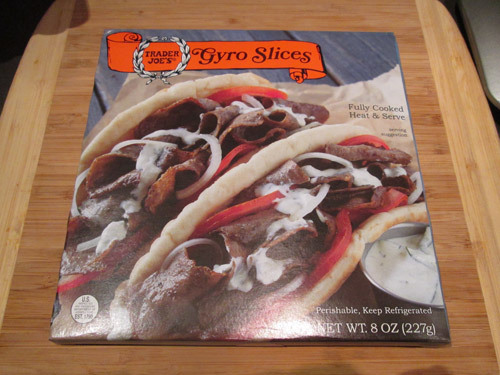 I went to Trader Joe's multiple times before I finally scored two glorious packages of Gyro Slices after probably 3 weeks of searching every TJ's in all of New York City. Did they live up to the hype I'd created in my mind? Oh my god, yes! These gyros are a mix of beef and lamb, and taste exactly like what you'd get at any good Greek place. 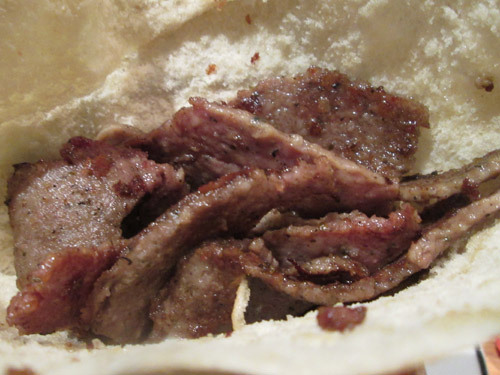 If you're skeptical about the beef part, and thinking "aren't gyros usually lamb? ", most places in the US seem to mix the two since lamb in the US can have a gamey flavor due to the breed of lamb raised here (they use a different breed in North Africa and the Middle East that doesn't have that gamey flavor). I made mine with some pita bread, three gyro slices, red onion, tomato, and some Trader Joe's Tzatziki Creamy Garlic Cucumber Dip. Tip: Be careful not too cook them too long so they don't get hard and burnt since they're super thin slices. I bought two boxes of these when I first found them, and ate them both in less than two weeks. I actually would sit at work and think about how excited I was about going home and making one for dinner. I've since starting keeping them stocked in the freezer for whenever the mood strikes.